In the coming months, I will add more tools to support your learning experience and help you integrate your growing knowledge and skill sets into new behaviors and best practices. Based on our conversations and your requests, these will include ebooks, books, podcasts, videos and webinars focusing on the help, inspiration, reflections and guidance I believe will enrich your journey. 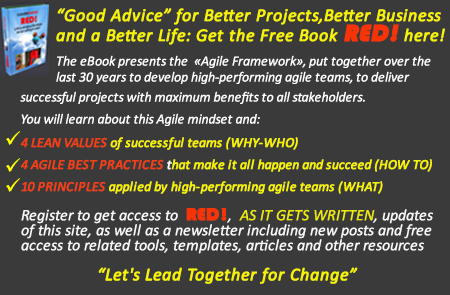 I plan to announce my first eBook “GREEN” soon: a personal look at agile, collaborative and co-creative project management principles and how-tos.